With the hectic pace of life today many couples hardly see each other during the week. Why not relight that spark by taking a romantic cottage holiday together? With so many opportunities for romance on a cottage holiday in Cornwall there is no doubt that you will return feeling both refreshed and renewed and more in love than ever before. It may be a cliché, but there are few things more romantic than strolling hand in hand down a sandy beach with the one you love. The beaches in Cornwall are some of the best in the UK, and with so many beautiful options to choose from you should have no problem finding one with enough peace and privacy to focus on nothing but each other. After your stroll down the beach why not visits one of the many award winning restaurants that can be found in Cornwall? From quiet cafes, to Michelin starred restaurants you should have no trouble finding the perfect place for a candle lit dinner for two. If you’d like to keep the evening more intimate, why not take advantage of the kitchen in your cottage. All of our cottages in Cornwall come equipped with everything you need to cook and serve a delicious meal; all you need to do is bring in some of the amazing produce that Cornwall has to offer. 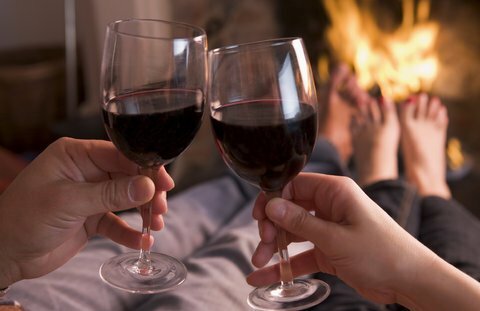 After dinner you’ll want to do nothing more than curl up together in front of an open fire, something that many of our cottages offer. We can also find you a Cornwall cottage with a hot tub, where you can both lay back and relax and let the stresses of everyday life slip away. Personally, one of my favourite things to do with my husband is to curl up under a warm blanket and look up at the stars. With the best weather in the UK, you should have no problem finding a night with clear skies and you can simply lie down on the grass and ponder your place in the universe. I promise it will feel as though you and your partner are the only people on earth. What should you do with your days in Cornwall? Well, after having a good lie in your options are really endless. For adventure seekers you can scale the cliffs at the amazing Eden Project, or sign up together to learn how to surf at some of the best surf beaches in the UK. If you’re looking for a slower pace, take a stroll along the breathtaking Cornish coastline together, or maybe rent a tandem bicycle so that no one gets left behind! The sky is really your limit when it comes to activities in Cornwall, you could even take a hot air balloon ride together and have the chance to see the world from a bird’s eye view! Why don’t you let yourself be pampered and visit one of the many exceptional spas in the county and have a couple’s massage, an experience that you won’t soon forget. Many spas will also organize to visit you in the privacy of your own home, so you’ll never need to leave the comfort of your cottage in Cornwall. Add some champagne and chocolate covered strawberries and it couldn’t get much more romantic. Cornwall is a beautiful county and your options for a romantic break away really are endless. With so many different cottage options to choose from you will have no trouble finding one that suits your particular needs. Why not surprise your husband or wife with a weekend away at a cottage in Cornwall today? You’ll return feeling closer than ever and with new plans to get away together every year. Hola! I’ve been following your web site for a while now and finally got the courage to go ahead and give you a shout out from Humble Tx! Just wanted to mention keep up the great job!